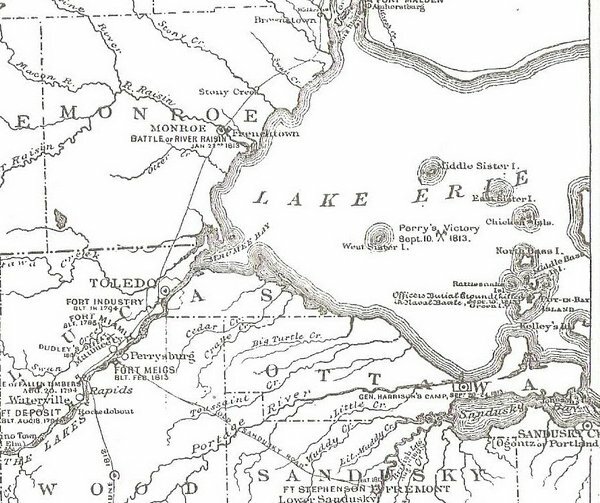 Lake Erie's Western Basin, where the amphibious operations waged by Harrison and Perry brought Detroit and Amherstburg (at top) under American control. The decisive Battle of Lake Erie in 1813 was followed quickly by a short and decisive, if less well-remembered, invasion of the Canadian shores near Fort Malden. Over a hundred years before the United States' major landings during the Second World War, an American army launched a successful seaborne invasion of a foreign shore. Major General William Henry Harrison had been waiting and preparing since February for the moment when operational initiative would be restored. As soon as news arrived that Commodore Oliver Hazard Perry's squadron had decisively cleared the British from Lake Erie on September 10, 1813, he ordered his plans into motion. Convoys of shallow drafted boats (batteaux or Schenectady boats constructed at the village of Cleveland, Ohio over the spring and summer) propelled by oars and sails skirted the Lake Erie shoreline on their way to the mouth of the Portage River. There, an invasion force was mustering to await transport, composed of the hard-bitten troops of the Northwestern Army. More boats sailed downstream along the Maumee River out to the lakeshore, moving Duncan McArthur's brigade of regular infantry along with a company of regular artillerymen. In addition to Harrison's regulars, his old friend Kentucky Governor Isaac Shelby (nicknamed "Old King's Mountain" for his role in leading the American forces during that Revolutionary War battle) arrived at the head of 3,500 mounted volunteers from his state, organized into three divisions. When it turned out that they would not be able to bring their horses with them, the entire Marblehead Pennisula was fenced off and they left the mounts there to graze. It is the intention of the Genl to land the army upon the enemys Shore. The following will be the order of debarkation; of march and of battle. The right wing of the army will be composed of the Kentucky Volunteers under the command of his excellency Governor [Isaac] Shelby, acting as Major General. To the left wing of the light corps of Lt. Col. [James V.] Ball and the brigade of Gens [Duncan] McArthur and [Lewis] Cass. This arrangement is made with a view to the locality of the Ground upon which the troops are to act and the composition of the enemy's force, and it is calculated in marching up the lake on streight to place our regular troops in the open ground, when they probably will be opposed by the British regulars; and the Ky. Volunteers in the woods which it is presumed will be occupied by the enemy Militia and Indians. When the signal is given to put to shore The Corps of Lt Col Ball will precede the left wing. The Battalion of volunteer riflemen the right wing-- These corps will land with the utmost alacrity consistently with the preservation of order. As soon as landed seize the most favorable position for annoying the enemy and covering the debarkation of the troops of the line. Genl Cass' Brigade will follow Col. Ball's corps. Genl Calimenes volunteers Riflemen The Regiment will land and form in succession upon those which precede them. The right wing with its left in front (the left wing) displayed to the right. The left wing with its right in front displayed to the left. The Brigades of Genls King, Allen and Caldwell will form successively to the right of Genl Calines. Genl McArthur's and Gen White's Brigades will form the reserve under the immediate command of Genl McArthur. The Genl will command in person the brigades of Genl Cass and Calmes assisted by Maj Genl Henry. His excellency Gov. Shelby will have the immediate command of the Brigades on the right assisted by Maj Genl Desha. As soon as the troops are disembarked the boats are to be immediately sent back to the fleet for the rest of the men. It will be observed that the order of landing here prescribed is Somewhat that of Direct displayed into lines upon the advanced corps of the right and left wings. It is the intention of the Genl however that all the troops that are provided with boats Should land in as quick succession as possible and that Genl officers coming towards the extremities of the line are authorized to deviate from the arrangement to counteract any movement of the enemy by landing any parts of their command previously to the formation of the corps which is here understood to precede them. The corps of Lt Col Ball and the volunteer rifle Battalion will retain the position they occupy until the troops of the line are formed to support them. They will then return through the intervals of the line or to the flanks and form in rear of the line. A Detachment of Artillery with a six pounder, a three pounder and howitzers will land with the advanced light corps. The rest of the Artillery will be held in reserve and landed at such points as Majr Wood may direct. The point of landing for the reserve of B. Genl McArthur can not now be designated . It will be intended to support any part of the line which may require aid or may be formed on the flanks as circumstances require. These orders were copied into the orderly book of every regiment and company participating in the landing. Even with their numerical advantage and the support of Perry's fleet, the American army had good cause to worry about an aggressive counter attack on the beachhead. The first large battle of the war, Queenston Heights in October 1812 had gone very badly when the first landing wave of American troops was not reinforced by New York militia. Despite seizing the high ground across the Niagara River, the Americans were isolated and forced to surrender after a vicious fight. Brigade orders. The troops of my Brigade will be prepared to embark at any moment when called and after the following manner. Each man will take with him his arms one blanket and provisions only the baggage knapsacks and camp equipage and sick of each regt. will be left in tents pitched for that purpose. The women and a suitable number of men as nurses will all be left. A report of the strength present of each company will be immediately handed in to the brigade major. Brigade orders. It is my wish that the companies of the several regts comprising my brigade will be arranged as to from platoons of equal size and strength and for that purpose until further orders Colonel Wells will cause 15 men in Capt Holt’s Company to be attached to the command of Capt. Bradford. Colonel Miller will cause 8 men of Capt. Elliot’s Company to be attached to the command of Capt. Herring and five men from each of Capt. Langham’s and the late Nearing Companies to be attached to Capt. Chunn’s. Also one subaltern from Capt. Herring’s Company to be attached to Lieut. Lee’s who will command the late Capt. Nearing’s Company. From the heads of companies in sections and in order to be prepared to act in that way each company in the camp will by the commandants of the regiments will (illeg.) into two sections and officers stationed to the (illeg.) of each and (illeg.) that no officer or soldier will be (illeg.) either on the march or in incampment from his company or the section to which he may be assigned unless from urgent necessity and should from any cause the present number of men reported in each company be augmented or diminished the commanding officers of regiments will be careful to have them so arranged as to comply with the intention of the above order. The genl. Cannot help expressing his astonishment at the number of guns which have been fired in violation of orders and that no names have been taken by the officers to punish the offenders. The commandants of regiments will endeavor to ascertain from what vessel flints and ammunition can be procured of which there appears to be a deficiency and have each man supplied with two spare flints and his box filled with cartridges. Lieut. Sanders is appointed extra aide de camp to Genl. McArthur and as such will be obeyed and respected. D Gwynne Brig. Aid Maj.
On this occasion, I commanded a battalion of artillery--all belonging to the N.W. Army--and crossed the lake with six pieces mounted in bateaux--one gun in each--loaded and matches lighted--so that I could have fought as well by sea as land. After all these preparations, the actual landings on September 27, 1813 were anticlimactic. Unlike Brigadier General Zebulon Pike's landing at York the previous April, there was no organized resistance. Instead, Major General Henry Procter ordered his division (composed of a single combat battalion, the 1/41st Foot, bits and pieces of other units like the Dragoons and Royal Veterans, and Tecumseh's Indians) to retreat. The forts and depots at Amherstburg, Sandwich and Detroit were burned. The two regular infantry brigades were ordered to hold the towns. In eight days, after forced marches, the Kentucky divisions and mounted units of the American army caught up with General Procter near a small settlement of Moravian Indians. Commodore Oliver Hazard Perry and Major Wood were both present, the former as a volunteer aide to General Harrison. Most of Procter's forces were captured, though the general himself fled. Tecumseh was killed, and after a sharp battle his followers scattered. Cooperation between American sea and land forces in the War of 1812 reached a peak here, but other campaigns would illustrate the importance of sea lines of communications--most notably during the siege at Fort Erie when the beleaguered American army was reinforced and resupplied by boats and naval vessels, and the Battle of Plattsburgh, when a British invasion was turned back by another naval defeat on Lake Champlain.